Please contact us before instant booking online to ensure that your dates are available. This condo is the perfect combination of luxury and location, this beautifully appointed 2 bedroom, 2 bathroom condo is located in the heart of Keystone at Expedition Station. Expedition Station is the ideal location for family entertainment, located in the heart of River Run Village you are just steps away from restaurants, retail shops and vendors. This unit is mere steps to the gondola which allows guests to be on the slopes before the crowds arrive. The updates and decorative touches throughout impart a sense of luxury and warmth that will ensure you are able to relax and enjoy your Colorado Rocky Mountain. The gourmet kitchen has an open design and provides stainless appliances throughout. An extended counter top provides a breakfast bar that will comfortably seat four. The open floor plan provides seamless flow and opportunity for interaction from the kitchen into the living room. You will find hardwood floors throughout the living area that lend style and comfort to this condo. 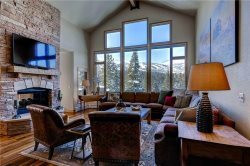 Relax in front of the stone fireplace, or take in the magnificent views of the Keystone Ski area from the arched windows in the living room. Step outside on the balcony to breathe in the crisp mountain air or watch skiers and boarders on the slopes. The living room provides a flat screen TV and DVD, as well as additional sleeping space for up to three people. Lounge on the comfortable sleeper sofa, or the single pull-out loveseat. A privacy curtain has been provided in the living room for guests sleeping in this space. The master bedroom provides guests with a queen bed, en suite bathroom with his and her sinks, flat screen TV and mountain views. The guest bedroom offers a queen bed, flat screen TV and views of the slopes. A second bathroom is located just off of the main entrance to the condo. This unit is sure to impress with its convenient location and spacious layout, providing comfort and excitement for the whole family! In the wintertime, enjoy an ice skating rink and outdoor fire pit located mere steps from the front door. In the summertime, you are perfectly positioned to join in the revelry offered in River Run Village. Whether taking in live music, sampling beer, or pigging out on Bacon, you will surely enjoy the proximity of this property to all that River Run offers summertime guests. If festivals are not your style, enjoy downhill mountain biking, golfing, hiking or horseback riding!